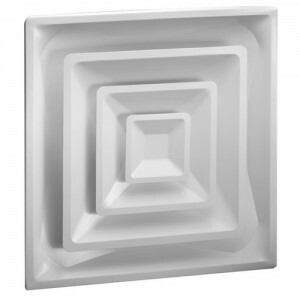 Hart and Cooley FPD3 Steel T-Bar Fixed Pattern Diffuser is constructed of steel square three cone core face and comes with a 12" fixed collar. Its 360-degree air diffusion provides high air volume delivery while the unique 2 inch high collar permits easy flex connections. Utilizing a butterfly damper, it is adjustable through the face. The FPD3 Diffuser features a bright white finish that is designed and manufactured to the highest performance standards, while delivering exceptional value, aesthetic appeal, and consistent performance.